A review of Colorado data on gun background checks contradicts recent claims by former Colorado governor and Democratic presidential hopeful John Hickenlooper. 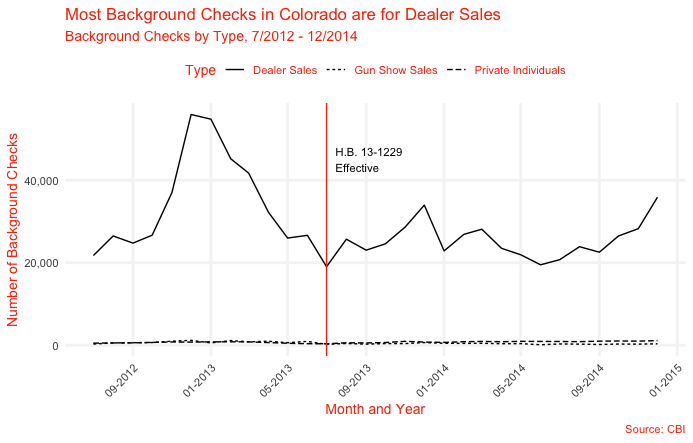 Hickenlooper has repeatedly touted his signature on a universal background check measure. He has said the law was important because background checks in Colorado have prevented people from purchasing guns and that the system in place beforehand didn't require checks on half of all gun sales. "In a state like Colorado with 5.5 million people, there were 38 people in 2012 who—and we only got to half the gun purchases—but there were 38 people convicted of homicides who tried to buy a gun and we stopped them," Hickenlooper told The Electables podcast last month. In 2013, then-governor Hickenlooper signed two new gun-control measures passed by the state general assembly in response to the Aurora Theater shooting, with one of those measures requiring so-called universal background checks. The bill, HB 1229, required nearly all sales between two private persons to go through a background check. Practically speaking, this meant the two persons engaged in a used-gun sale had to go to a federally licensed gun store and pay the store to conduct the same kind of check it would as if the purchasing individual were buying the gun from the store. Hickenlooper didn't respond to questions about how many of those denied by the background check system in Colorado were false positives and how many were prosecuted for illegally trying to purchase firearms. He also didn't respond to questions about his claim that the universal background check law would double the number of background checks in the state. However, data collected by the state in the run up to HB 1229's implementation and more than a year afterwards show that claim is factually inaccurate. To assess the impact of HB 1229 on gun checks in Colorado, the Washington Free Beacon looked at data from the Colorado Bureau of Investigations (CBI), originally obtained by the gun-control group Everytown for Gun Safety. Those data, which are monthly between July 2012 and December 2014, provide raw totals of background checks against sales by licensed gun dealers, by private individuals at gun shows, and by private individuals elsewhere. Before the passage of the universal background check measure in 2013, Colorado had already required background checks on private sales at gun shows—CBI had been tracking those sales. HB 1229 expanded that requirement to nearly all other forms of private sales. At that point, CBI began tracking those sales as well. Contra Hickenlooper's claim that the lack of universal checks was leading to half of sales being uncovered, data show the overwhelming majority of sales pre- and post-HB 1229 were clearly attributable to purchasers at already-covered, licensed gun dealers. A closer look at private sales further reveals HB 1229's minimal effect. Total private sales remained roughly constant following its implementation. In December 2012, before the law's implementation, 1,940 checks were performed on private sales while December 2014, after the law's implementation, saw only 1,446 private checks. 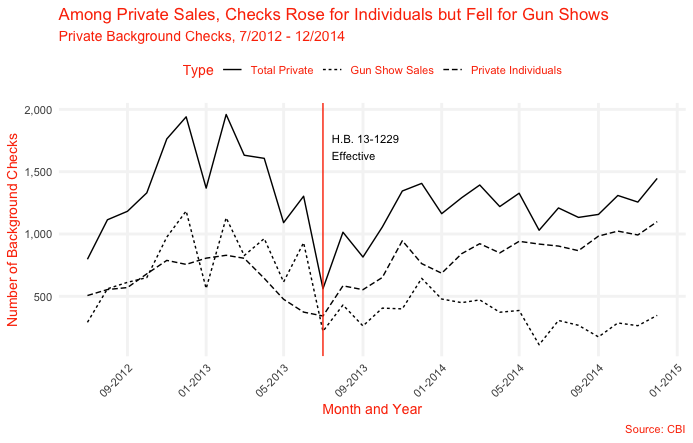 In fact, while the number of background checks of private individuals rose, the number for gun show sales fell, leading to a net effect of essentially zero. A review of the Federal Bureau of Investigation's National Instant Criminal Background Check System data shows the number of checks on firearms sales in the rest of the nation declined from 14,371,496 in 2013 to 12,731,613 in 2014—a decrease of 11.4 percent. Over the same period of time, after the universal background check law went into place, Colorado saw an even steeper decline from 425,376 in 2013 to 358,770 in 2014—a decline of 15.6 percent. Additionally, while the financial impact for HB 1229 estimated there would be 200,000 private sales between July 2013 and July 2014, the state only ended up processing 4,830 private sales in that time period—only 7.4 percent of the original estimate. There is little evidence from these data sets to suggest that HB 1229 had much of an impact at all, never mind doubling the number of gun sales that were background checked as Hickenlooper claimed. Further, Colorado's experience suggests private sales are not as prevalent as some gun-control advocates suggest, or a universal background check system doesn't capture as many private sales as advocates suggest, or likely a combination of the two. 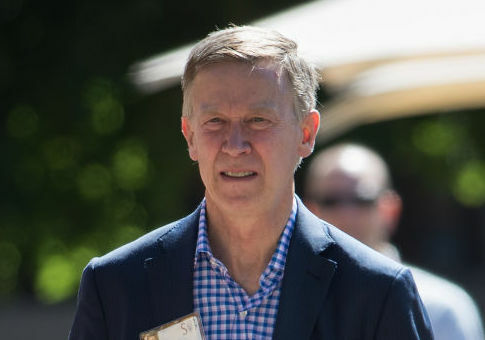 Hickenlooper is among the crop of "moderates" in the 2020 presidential field when compared with further left candidates like Sen. Bernie Sanders of Vermont or Massachusetts senator Elizabeth Warren—touting a major expansion of gun control in a "purple" Western state may be an attempt to enhance the governor's resume to the liberal portion of the Democratic base. However, Hickenlooper's comments on the practicality of gun background checks and rationale for signing the 2013 gun-control laws have seldom been cohesive and have frustrated gun-rights and gun-control supporters alike. Shortly after the 2012 Aurora shooting, Hickenlooper told CNN he wasn't sure expanded background checks would have stopped the crime. "This person, if there were no assault weapons available, if there were no this or no that, this guy's going to find something, right?" Hickenlooper said at the time. "He's going to know how to create a bomb. Who knows where his mind would have gone? Clearly a very intelligent individual, however twisted." "And, you know, if it wasn't one weapon, it would have been another. I mean, he was diabolical. If you look at what he had in his apartment and what his intentions were, I mean, even now it makes the hair on the back of my neck stand up." By January of 2013 as the new legislative session was starting, Hickenlooper was on board with not only the "universal" background checks, but also with a 15-round limit on magazine capacity. The passage of the two bills led to a furious backlash resulting in the successful recall elections of two state senators, and a third who resigned when petitions for her recall were turned in. In June 2014, as he was preparing for a reelection year, the governor made remarks to a group of county sheriffs that only increased the confusion. "Universal background checks—I'll tell you the funny story—this, and it is a weird—I think we screwed that up completely, and we did a disservice to you and a disservice to ourselves," he said. Now, as he runs for the Democratic presidential nomination, Hickenlooper has made the gun-control bills he signed a centerpiece of his campaign. "After Aurora, we stood up to the NRA and we passed universal background checks and limits on high capacity magazines in a Western state," Hickenlooper said in his campaign announcement. This entry was posted in Politics and tagged 2020 Election, Guns, John Hickenlooper. Bookmark the permalink.